These are my favorite writing tools that slash the editing process for me in half- for real! I get so tired of my children asking me how to spell words when they are writing. I also feel that they become dependent on me to spell words for them. To curb that habit, I have my boys use a spelling dictionary. This resource helps my children to learn how to write independently. Now I rarely get the question, "Mom, how do you spell...?" 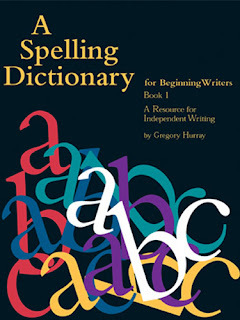 This is definitely the best spelling dictionary for elementary children that I have found. It is certainly worth the $6.00! Besides listing words in alphabetical order, it also has several pages of words for particular themes. Another timesaver I have used is using checklists, which children can use to edit their own work or a partner's work. Children enjoy acting like the teacher, and they will usually edit someone else's work much better than their own. Something I have learned from my own editor in writing books is that a peer can easily spot mistakes that the writer cannot. I can easily edit other people's writing but I am the worst editor of my own writing. When I begin to grade my children's writing, most of their work has already been spelled correctly and edited. Now I can focus on the main writing concepts they need to improve on instead of the minor repetitious errors.